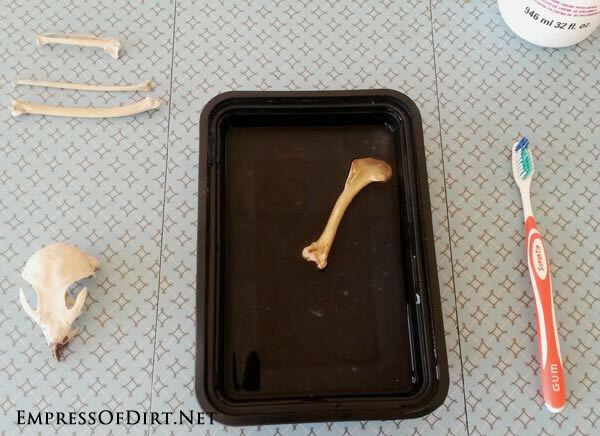 This step-by-step tutorial for how to clean bones, including bleaching and whitening, walks you through the basic process for preparing animal bones for display. 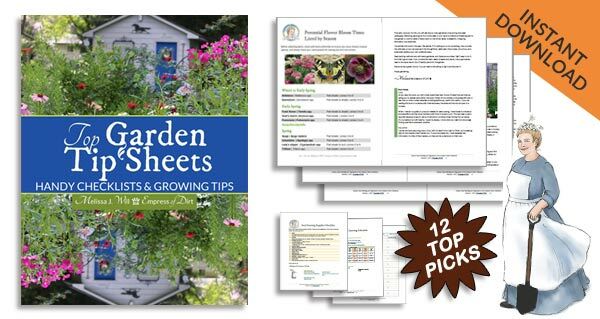 This is a good project for homeschoolers and others who enjoys collecting and displaying natural treasures. 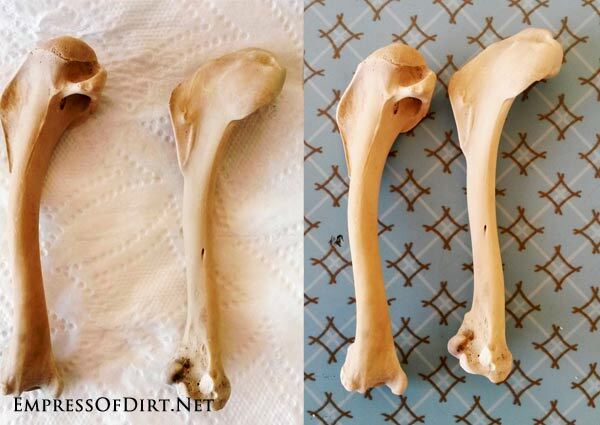 For more posts on this topic, also see What To Do if You Find Bones in Your Garden and 7 Incredible Backyard Bone Finds. There are various methods for cleaning bones, depending on the condition of the dead animal. The process shown here uses peroxide and is suitable only for a bare skeleton free of soft tissue. Please note, this article is for general information only. Animal carcasses can contain zoonotic diseases that spread via bodily fluids and should not be handled. 1. They will look nicer (whiter, smoother surface). 2. They are less greasy and therefore grow less bacteria. 3. They feel and smell better than uncleaned ones. 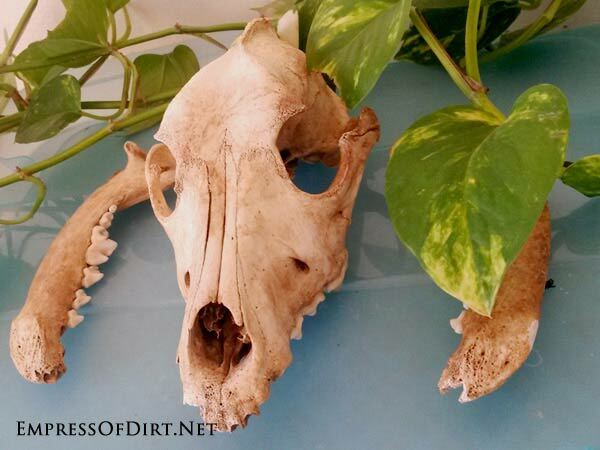 Want to Display Some Animal bones? 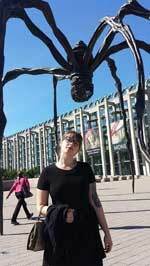 In love with spooky skeletons? 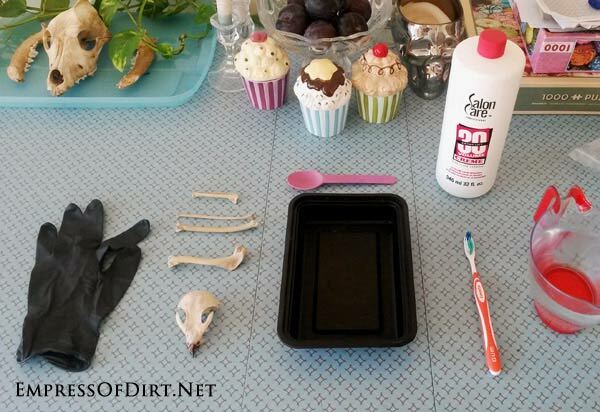 This quick and easy tutorial will show you how to lighten and clean found animal bones for safe storage and display. 1) Rubber gloves -I find that hairdressing gloves work best, but any rubber or latex gloves are fine. 4) Cream developer (peroxide) -I used 30 Vol., but any volume 30 or lower will work. 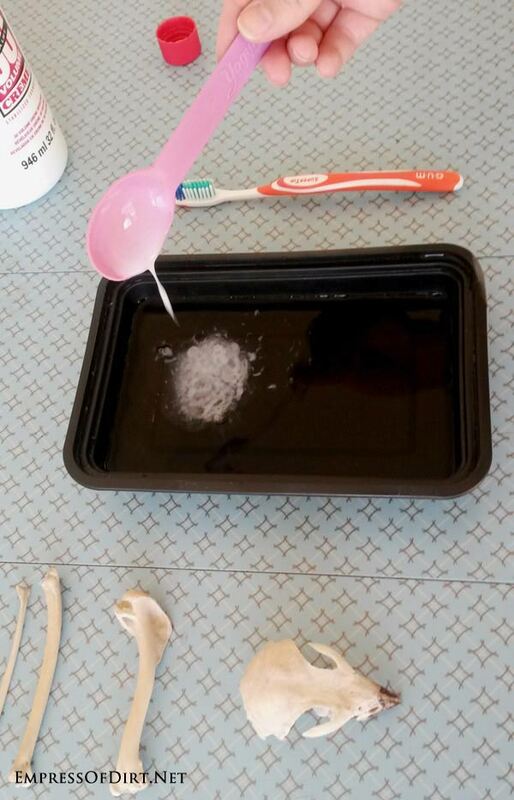 5) A cup or two of water -I used 1 ½ cups, but the amount will vary depending on the size of the bone. Make sure you have enough water to cover the bone completely in the container. 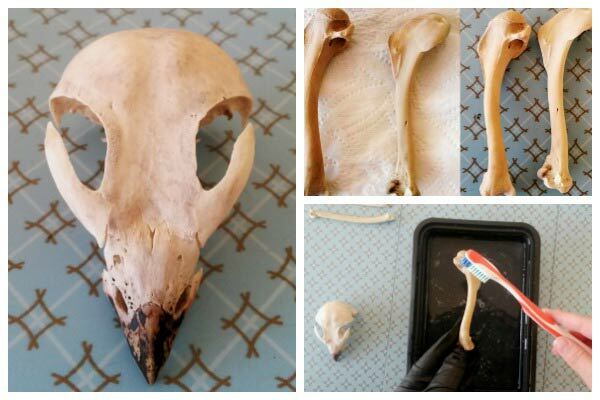 7) Animal bones -I used a falcon for this project, but you can use any critter you happen to find. I would recommend starting out with a small mammal (e.g. a squirrel, raccoon or fox) rather than a bird or rodent which are more fragile and prone to breakage. *Pro Tip: Make sure never to use metal tools when working with peroxide. I reused an old takeout container and spoon, but any plastic container and utensils will work. Also be sure you are wearing old clothes that you don’t mind staining, and work on a surface that can be quickly wiped if you happen to spill. 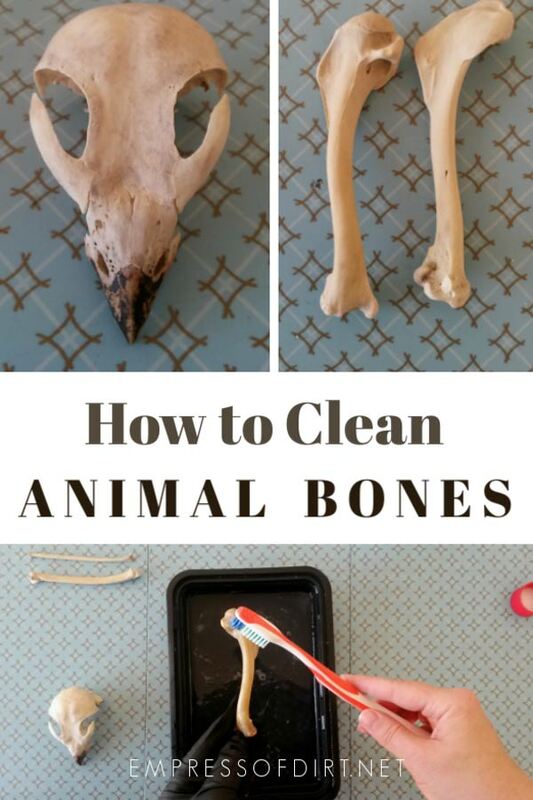 1) Pre-wash your animal bones with slightly soapy warm water, rinse, and set it aside. 2) Fill the plastic container with enough water to submerge the bone, but leave enough room that you can put your hands in without spilling. 3) Pour a small spoonful of cream peroxide into the water. The amount you need will depend on how large an animal you’re working with and how much water you used, but generally aim for a 1:10 ratio of peroxide to water. 4) Stir the peroxide and water until it is well mixed. Make sure the peroxide is evenly distributed but don’t worry if it doesn’t dissolve completely in the water. 5) Place the bone in the water and allow it to soak for 2-5 minutes. If your bones are very dry (e.g. sun bleached), just a quick soak will be fine. Greasier bones will need longer, but be careful not to leave them in longer than 5 minutes or they may become brittle. Also note that bird bones are more fragile than mammals, and may require less time to soak. 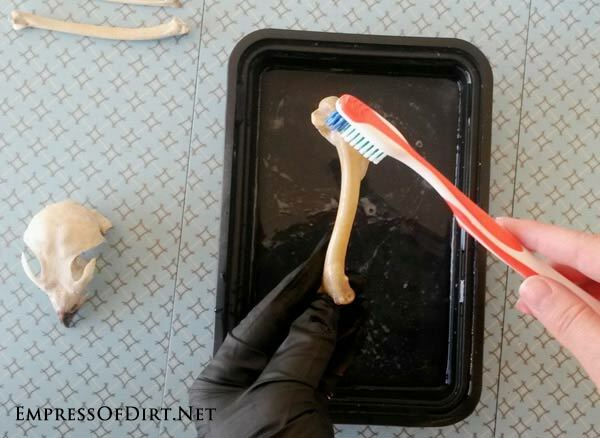 6) Dip the toothbrush in the water and lightly buff the entire surface of the bone. No need to scrub! Just a very light amount of pressure is enough. Concentrate especially toward the bone ends as they tend to hold the most grease and be the most stained. 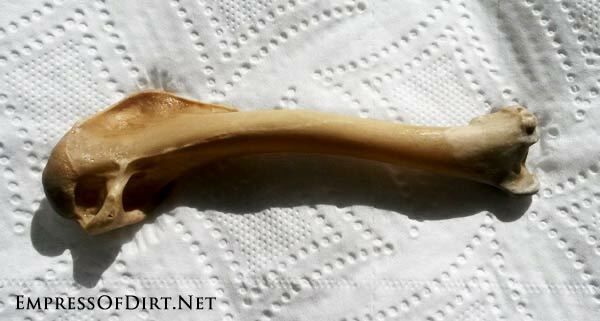 7) Remove the bone from the water and place it on a paper towel in a sunny spot. Allow it to dry completely (mine took about half an hour, but larger bones may take a little longer). 8) And you’re done! Once the bones have completely dried, they should be noticeably lighter in colour and have a smooth, non-greasy finish. The results of this process will vary depending on the state of the bones prior to lightening. 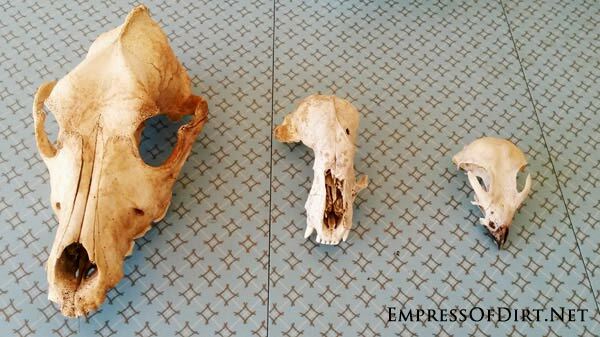 The dog skull shown (above, left) was found in a garden and has a darker, more rustic natural finish to it after cleaning, whereas the raccoon (centre) was found on the surface and sun bleached, leaving it with a bright white matte finish. Finally, the falcon (right) was cleaned using an enzyme solution and cooked prior to lightening, making it ideal for frequent handling or use in teaching. I like to display my bone collection alongside other natural treasures like plants, stones, feathers, fall leaves, shells, and tree bark. Make sure to dust regularly and keep them out of reach of pets. I hope this has provided a good overview of the bone cleaning process. If it’s something you’re interested in, be sure to research best practices for safely handling bones (or carcasses) and which method to use depending on what you have found.